Basement waterproofing has a lot in common with clinic checkups, car oil changes, and other regular maintenance: if you do it before you need to think about it, you’ll save money and keep things going smoothly. However, if you avoid thinking about it for too long and you miss all the warning signs, you’ll wind up with an expensive disaster on your hands. Whether you’re talking about basement waterproofing in Pylesville, Maryland or repairing a leaky foundation in the middle of Baltimore, the fact is that nothing lasts forever. Building foundations have to bear a significant weight for many decades without moving, and that’s despite the strain brought on by rushing rainwater and the constant push and pull which the surrounding soil generates. Construction workers and foundation contractors have a few different techniques they use to reduce this strain: for instance, gutters and clever landscaping can keep rain from building up along the sides of the house and doing damage to the foundation. Also, by filling in the holes around the basement walls with stones instead of sand or clay, the water that does hit the sides of the house will slide all the way down to a level beneath the foundation. Water has a way of making foundation damage go from bad to worse in no time flat. This is particularly true in places that go below freezing for part of the year: ice takes up more space than water, so any water that gets into a crack in concrete or asphalt will expand and widen the space. Then, the next time the ground water has a chance to melt and then freeze again, more water will have made its way into the larger opening, and so the damage accelerates as time passes. However, while the physical damage is potentially bad, the biological damage may be even worse. Life can’t exist without water, which is why it’s best to store things you want to preserve in a cool, dry place. Once you add some water, however, you invite in all sorts of molds, insects, arachnids, and other creatures that can survive on the little water that trickles in through the crack in the concrete. 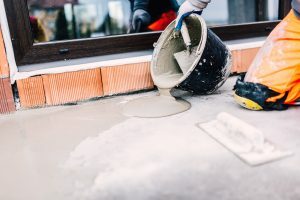 For both these reasons, it’s important to perform your basement waterproofing in Pylesville or in any other part of Maryland as early as possible to keep damage and costs to a minimum. If you catch a leak early enough, you may even be able to repair the damage yourself, although you might want to get a professional opinion before you do anything permanent. Fortunately, AA Action Waterproofing is here to help you out no matter what you need. Our foundation experts can deal with everything from crawlspace encapsulation in Frederick to mold remediation in Silver Spring and basement waterproofing in Pylesville. Our company has been in business since 1987, and in all those years we’ve never met a foundation job we couldn’t handle. We can help out whether you need us for a job or for our expert advice. Our first inspection and job estimate is free and has no strings attached: if you don’t want our services, you’re free to walk away. We’re also available as consultants for new foundation construction jobs. When you work with AA Action Waterproofing, you’re working with some of the best foundation, crawlspace, and basement experts you can find in Maryland and throughout the neighboring states. Whether you need something simple like basement waterproofing in Pylesville or something big like a complete foundation replacement in Fort Meade, we can get the job done right, on time, and on budget.